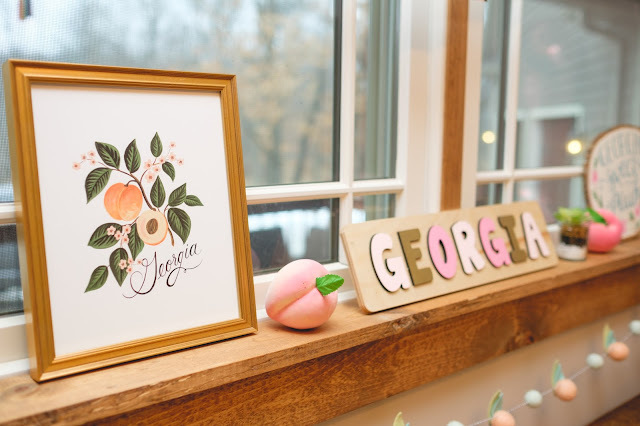 I knew from before Georgia was born that the theme of her first birthday would be Sweet as a Peach. Once we decided on her name, it was totally obvious to me that I would become with all things peach. I began pinning away like a mad woman and saving all kinds of fun things on Etsy that I would have to have for her first birthday before she was even born! 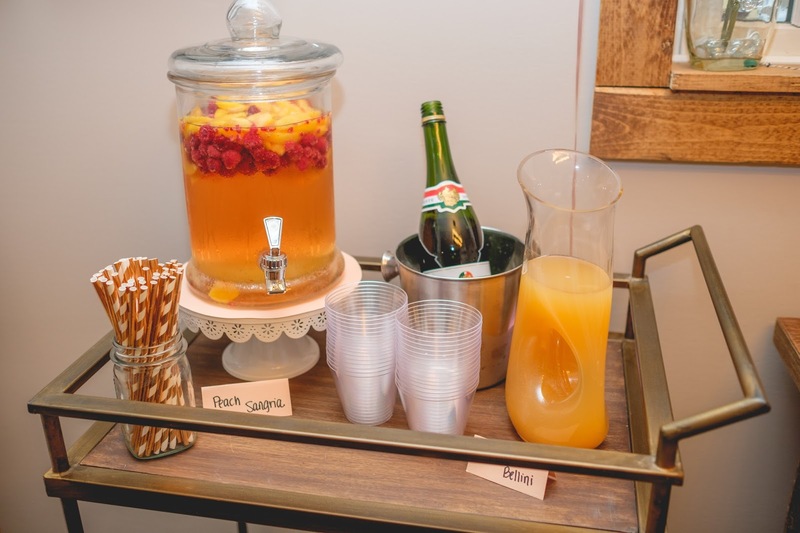 I was very specific about every detail of this party. I have dreamed of a first birthday party for years and now that I finally got the opportunity to throw one, I went all out. First and foremost, invites. 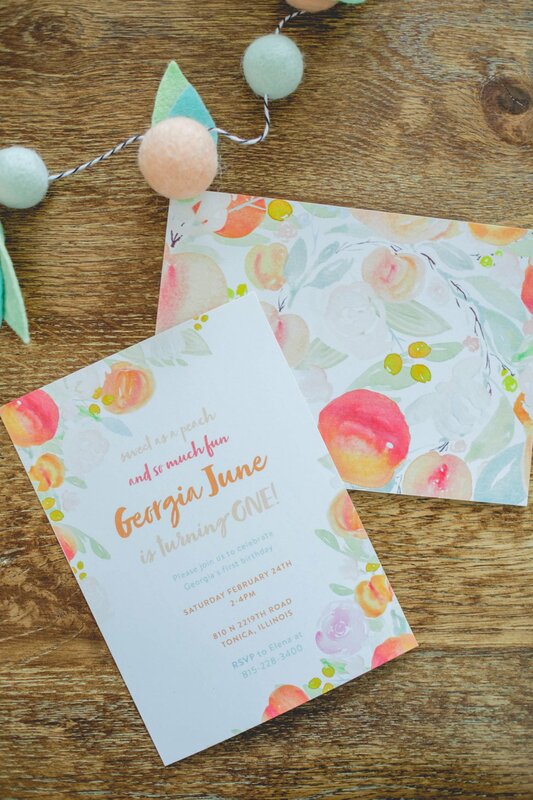 Invites give people an idea of the theme & it's where first impressions are made. I scoured Etsy for one that was feminine and colorful but not too cheesy. I found these and was so happy with how they turned out, plus the shop owner was extra helpful which is always big in my book. 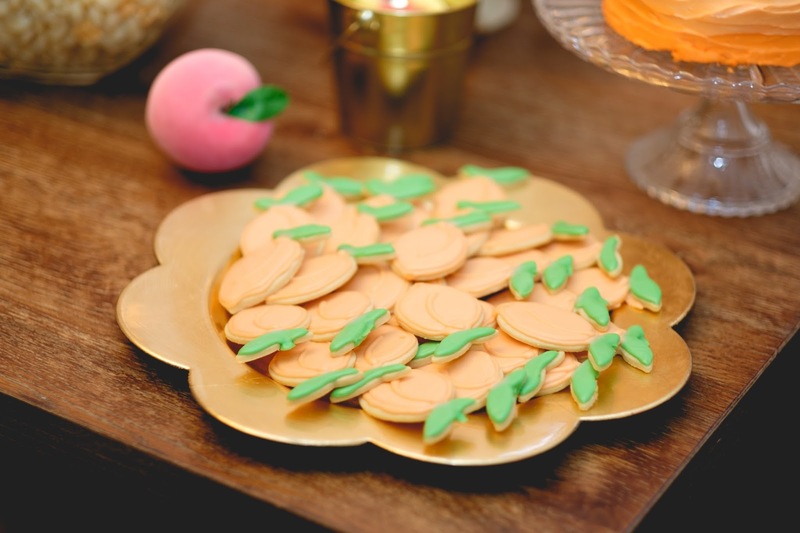 I also knew I had to have the peach cut out cookies and cakes made by my little sister in law who does baking on the side for fun. You can check out some of her awesome creations on her Instagram. I was soo happy with how all of her treats turned out. She did an amazing job and they looked exactly like I had pictured them. 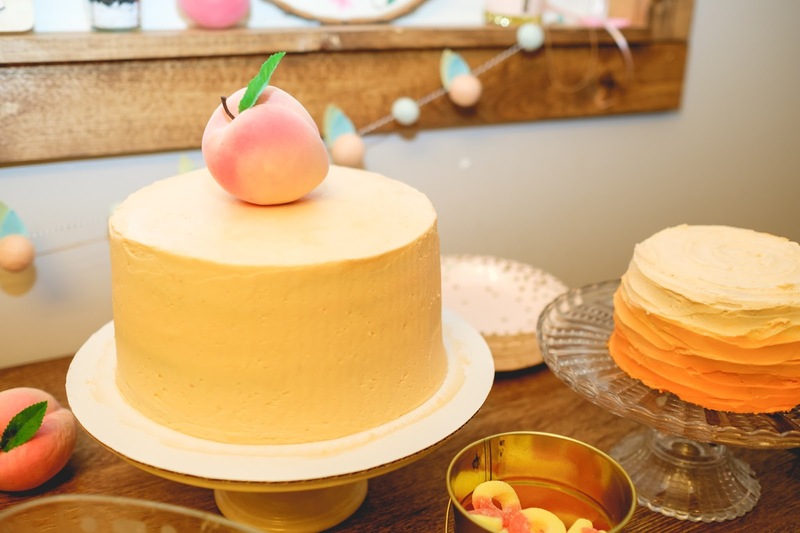 She added a peach gelatin to the cake mix to give it a little extra flavor and it was so yummy! For food I decided that chicken salad would be easiest. I bought an entire chicken and a bag of frozen chicken chicken breasts and boiled the chicken and the chicken breasts then threw it all in my Kitchen Aid standing mixer with the paddle attachment to get it shredded up really fine. I added some avocado mayo and some chopped celery along with salt and pepper. That was it. It was yummy and everyone liked it. I also made a cold pasta salad and my mom made a fruit salad and MIL made a spinach salad with mandarin oranges. It was all really good and really light. I served the chicken salad on sweet Hawaiian rolls which are always delicious. I made a peach sangria that I found on Pinterest but ended up modifying it a little bit. It was champagne, peach schapps, frozen peaches, frozen raspberries, and Pinot Grigio. I really kind of just threw it in how I saw fit and it was really good. I also did peach bellinis, peach pear LaCroix, Dasani white peach, and these adorable little canned wines from Trader Joe's in a peach flavor. 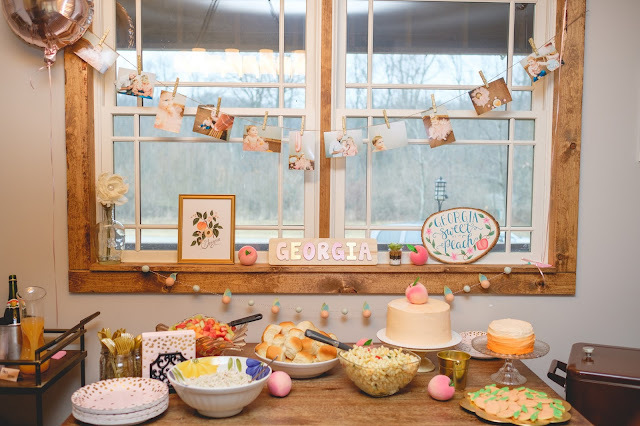 One of my favorite details about the party was the gift that I found for Georgia. I found it months ago and ended up getting it for her as a birthday gift and it came FedEx the morning of her party. I had my eye on this Rifle Paper Co Illustrated Peach for a long time and thought it would work perfect as a gift for her rather than more toys. 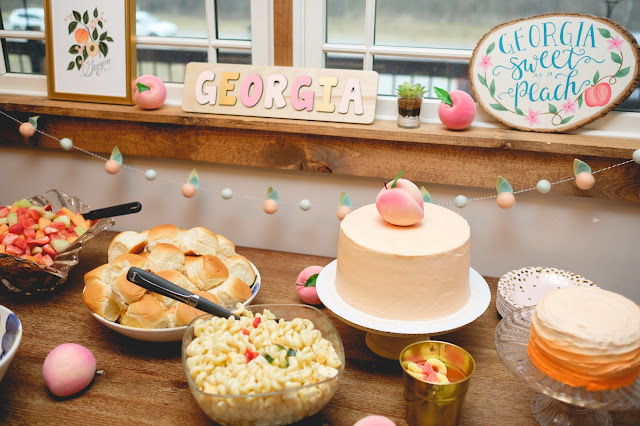 The puzzle was another gift that we received from a friend of ours and the faux peaches I actually got at Walmart online for her newborn pictures and we have used them several times for photo props and even used one has her cake topper. The peach garland is from Hooray Everyday on Etsy! We had an absolute blast celebrating our little peach turning one. We had a packed house and it was amazing to see all the people who just love and adore her as much as we do. 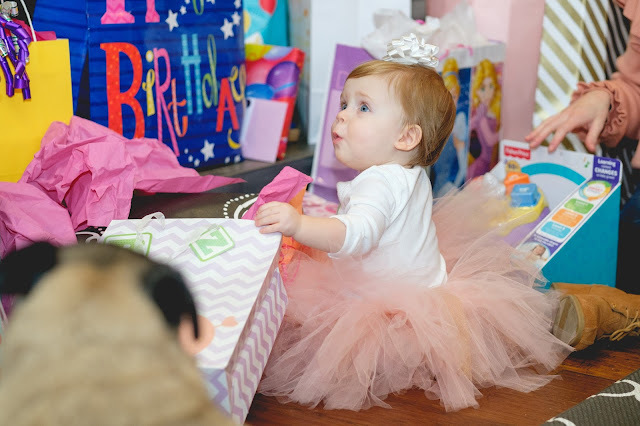 She got some really great gifts and loved opening all her presents. 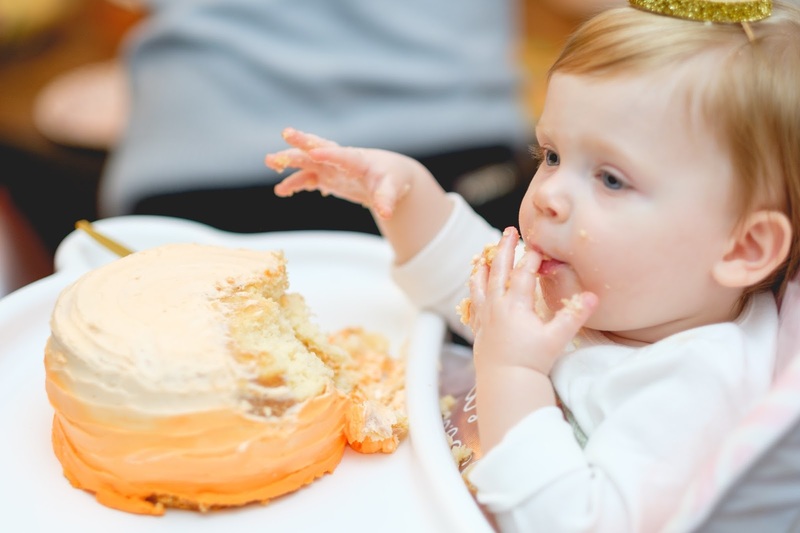 She was such a trooper and enjoyed her smash cake and partied til bed time. I still can't believe we now have a toddler. 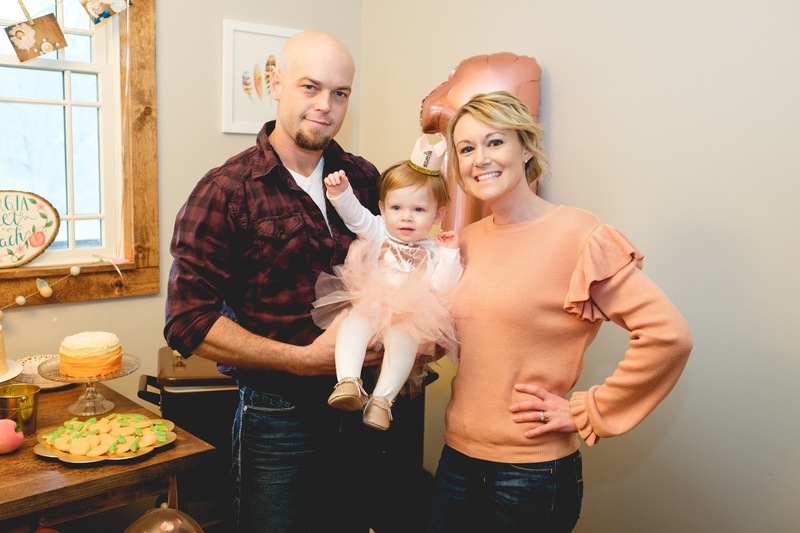 The time continues to fly by, but I will always remember how special her first birthday party was. Thank you to Capture By Lauren for the amazing photos. Ahhh I've been waiting for this post! Everything looks great! I'm like you and had Rory's 1st birthday party planned out before she was born and I also have Rhylan's 1st planned lol. It is just so much fun! 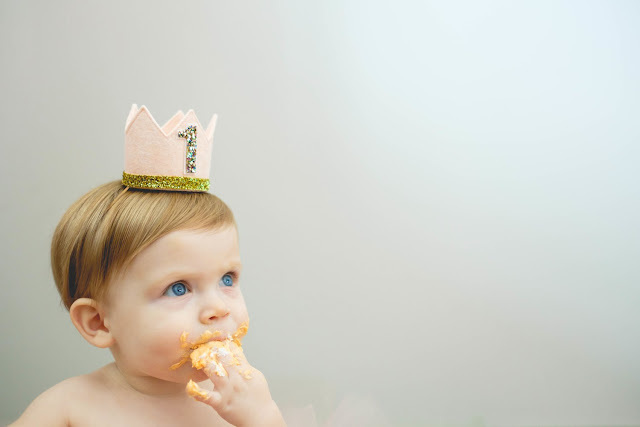 And we have to take advantage of being in control of the party planning while we can. I have to say I absolutely loved going to this place the other night. The people that work there were trying to create an optimal dinner experience while making your choices their priority. I would definitely recommend this event space Atlanta for any kind of fancy event. The party setup looks amazing, I can see that you planned the whole event very well. Obviously it’s very special for parents to celebrate their kid’s first birthday. 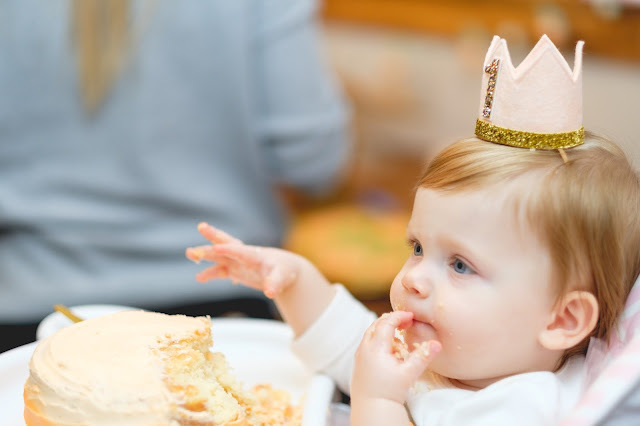 I also have lovely memories of my son’s first birthday party which we had hosted at one of the popular LA event venues.